Hey y'all! 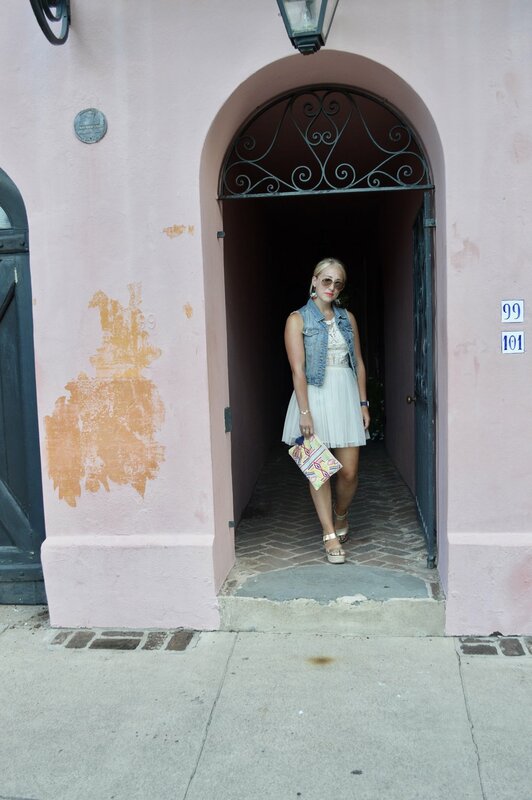 Hope y'all are having a fabulous weekend, I'm sharing another Charleston outfit, one of my favorites I must say! I now know why dresses are such a popular piece down south. It was hotter than you could believe down there, but this dress kept me as cool as possible and of course kept me feeling just as fabulous! This dress was a must have I picked up from a local store called Serendipity back in Portsmouth, I wasn't sure where or what I would wear it to or for I just knew I had to have this tule, lace combo. Sometimes I'm hesitant to buy pieces such as this one that seem to be a little bit more on the dressy side unless I have an event to wear it to, but this time I decided I would make it work and I'm glad I did because way cute!! Which has led me to create a new rule: Wear what you want when you want! A touch of everlasting red lipstick, gold platform wedges, a jean jacket, tassel earrings and a geometric patterned clutch sounds overwhelming to say the least but makes for the perfect way to accessorize this white lacy beauty. My earring are a new purchases that I got while in Charleston from a shop downtown called The Impeccable Pig. I loved this cute little boutique from the name to the workers right down to the clothing and jewelry there was everything to love and nothing to hate. They also have these pretties in a pale pink and grey combo, which are just as cute. The jean jacket was my personal touch although it was blazing hot, this layer was a perfect touch and truthfully didn't kill me in the heat. The dress does look just as cute without the extra layer, however, it's see through so a cute bralette for underneath is a must. You have probably seen these gold wedges many a times on Love & Labels thats because I love LoVe LOVE them. They are kinda of my go to shoe for when I'm going out and dressed up just enough that I'm not feeling sneakers, but I know I'm going to be walking a good amount. Plus they just always seem to match everything and give me that extra lift. But WARNING! they are ankle twisters, you have to take it slow in these babies, they are beyond comfortable though do not get me wrong. Just strut your stuff a little slower on days you want to wear these beauts. Love this look for a day on the town, out to dinner, or just cause you want to feel and look fab! This look made me feel all kinds of gorg, I could twirl around in this number all day long. Isn't that just the best?